Like a soul waiting for the ferry,"
IN THIS RESIDENTIAL STUDY WEEK we will be, discussing aspects of Ted Hughes work including his poetry, prose essays and letters, and his work for children (much of How the Whale Became was written in Benidorm). The course is designed to suit interested readers of Hughes, postgraduate students, teachers and poets at all levels. TERRY GIFFORD is the author of Ted Hughes (2009), Reconnecting With John Muir: Essays in Post-Pastoral Practice (2006), Pastoral (1999) and Green Voices: Understanding Contemporary Nature Poetry (1995; 2nd edn. 2011), together with six chapters in books on Ted Hughes. He recently edited The Cambridge Companion to Ted Hughes (2011). His seventh collection of poems (with Christopher North) is Al Otro Lado del Aguilar (Oversteps Books, 2011). Terry Gifford is Visiting Scholar at Bath Spa University's Centre for Writing and Environment, UK, and Senior Research Fellow and Profesor Honorifico at the University of Alicante, Spain. LORRAINE KERSLAKE holds a BA in English and French studies and an MA in Translation and Interpreting from Alicante University, Spain, where she teaches English Language and Literature. She has worked as a translator of literary criticism, poetry and art and published articles and reviews on children's literature and ecocriticism. Her current research interests include children’s literature, the representation of animals and nature in literature and art, ecocriticism and ecofeminism. ALMASSERA VELLA is Relleu's original olive press opened in 2002 by Christopher and Marisa North as a Literature and Arts Centre. Comfortable bedrooms, private bathrooms, day-room, loggia, 3000 book library, Free wi/fi, a refectory and a meeting place with log fire. Extensive rear terrace, pool and almond orchard and nearby olive and citrus groves. Relleu is an ancient mountain village with modern pharmacy, general store and bars. Alicante airport is 50 minutes away. Cost of the week ₤750 all inclusive (7 nights) save Flight/travel and insurance. This is a second post on recently found articles authored by (or in some instances possibly/probably authored by) Sylvia Plath. The first article was posted on 20 May 2014. This post presents two new, additional newly found articles authored by Sylvia Plath. On 4 and 5 February 1952, Sylvia Plath attended two lectures on the campus of Smith College for Press Board. The lectures were conducted American theologian Reinhold Niebuhr, who was at the time professor of Christian ethics at Yale University. She wrote about covering the lecture in letters to her mother dated on 4 February and 6 February. The 6 February letter was included in Letters Home (page 83), but was printed—like many—under the postmark date of 7 February. Plath's calendar for 1952, held by Lilly Library, confirms that she attended the lecture, held in the Browsing Room of the Neilson Library, at 8:00 pm on 4 February; and that she had an "early writeup" due to the Springfield Union by 11 pm. A note on the 5th indicates that the Niebuhr article was due at 8:30. (I think this would be 8:30 am). In a bit edited out of the 6 February 1952 letter, Plath writes that she felt professional having to call in the news story to the newspaper "last night" (i.e. the 5th). So, while some of these dates and times are hard to match up or really make sense of, what we know is that Plath attended the lectures for Press Board, wrote up article(s) on them, and telephoned the article at least one of them in to the Springfield Union. But, did the article(s) run? If you look for anything dated 5 or 6 February 1952 in Stephen Tabor's Sylvia Plath: An Analytical Bibliography you will not find anything. However, if you look at the microfilm for the Springfield Union, you will. This post, therefore, presents two new additional newly found articles authored by Sylvia Plath (see this post on another recently located article by Plath). 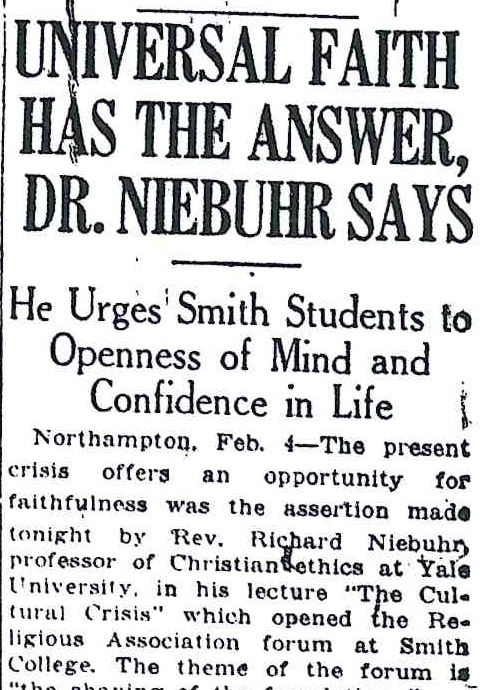 "Universal Faith Has the Answer, Dr. Niebuhr Says" ran in the Springfield Union on 5 February 1952, on page 21. The article is unattributed, but there should be confidence based on Plath's letters and calendar that she did in fact author this piece. The article is a review of Niebuhr's lecture "The Cultural Crisis" which opened the Religious Association forum at Smith College on the theme of "The shaping of the foundation". 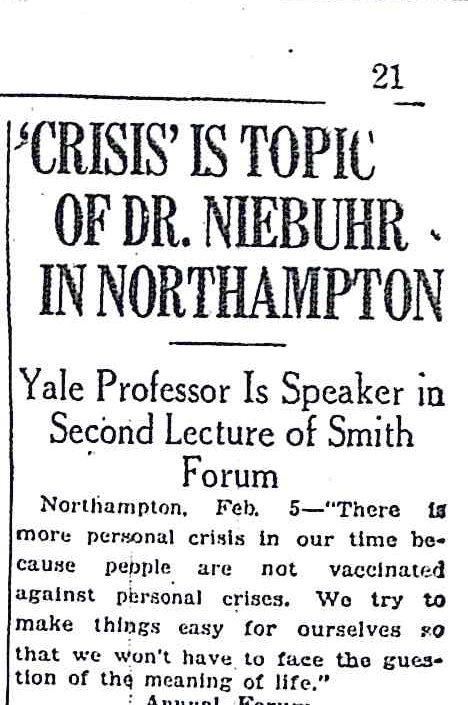 "'Crisis' Is Topic of Dr. Niebuhr In Northampton" ran in the Springfield Union on 6 February 1952, on page 21. This article is a review of Niebuhr's second lecture, "The Personal Crisis", and this is the one that Plath telephoned in late on the 5th. I would be remiss if I did not mention that there must exist some doubt in Plath's authorship because a) she does not get a byline and b) there does not to my knowledge exist any documentary evidence of an article (typescript) authored by her. However, we do have her letters and her calendar to lend some support in favor of the claim of Plath authoring these articles. When we think of Sylvia Plath, we think first of her poetry and novel The Bell Jar, as well as her short stories, her letters, and journals. The "journalistic" Plath might be the lesser known of all her writerly selves, but it is no less important. She dedicated two full academic years to this kind of writing, and published full-length articles, often illustrated, for the Christian Science Monitor off and on in college, but then also periodically between 1956 and 1959. There are varying degrees in these writing, some are impersonal, such as her write-ups for press board, which merely recap the event(s) covered. On the contrary, the articles that appeared in the Christian Science Monitor, and even is Isis and Punch are closer to her creative writing in that there is something "personal" about them, something to do with an experience, her experience. All links accessed on 30 May 2014. 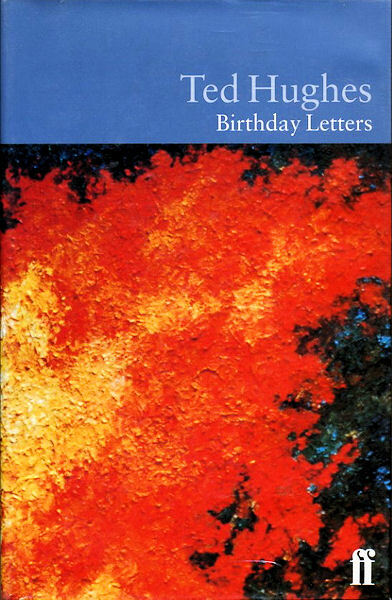 This is not naturally something I would expect anyone to know, remember, or commemorate, but ten years ago this month my biography of Sylvia Plath (Chelsea House Publishers, Great Writers series) was published. (Amazon's page claims that it was published in April, but copies were not available until June. It also has a capsule review, still, for the wrong book. #OhWell.) To those who have read it: Thank you! To those who have not, it is available in both hardback and Kindle editions, and also available in many libraries around the world, and through some used book shops. Sylvia Plath formed one sixth of an original series that also includes biographies of Barbara Kingsolver by Linda Wagner-Martin, Kurt Vonnegut by John Tomedi, J.R.R. Tolkien by Neil Heims, Charles Bukowski by Michael Gray Baughan, and Jack Kerouac by Jenn McKee. The series expanded the following year to include books on five gay and lesbian writers: Adrienne Rich by Amy Sickels, Allen Ginsberg by Neil Heims, James Baldwin by Randall Kenan and Amy Sickels, Oscar Wilde by Jeff Nunokawa and Amy Sickels, Walt Whitman by Arnie Kantrowitz, and Sappho by Jane McIntosh Snyder and Camille-Yvette Welsch. I have not yet read the other books in the series, but as I think about this, maybe I should. Has anyone out there read any of the others? At the time it was published, it was the first new biography of Plath to appear since 1991, when Paul Alexander's Rough Magic: A Biography of Sylvia Plath and Ronald Hayman's The Death and Life of Sylvia Plath were published. 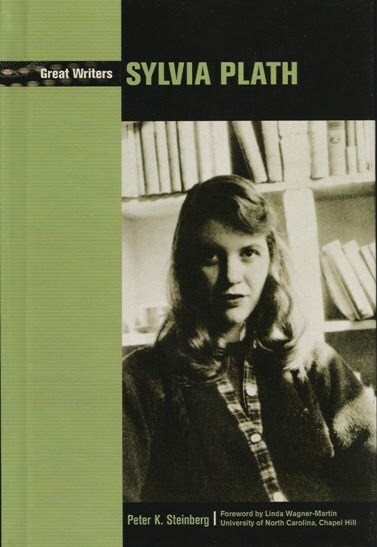 The book was written for a specific audience in mind: junior high and high school aged children and college students, to serve as an introductory text that might inspire its readers to both become interested in Plath's writings and life, and lead them to potentially investigate full-length biographies as well as works of criticism. Notwithstanding, it presented snippets of new information never previously known or mentioned in other biographies. One of the aims of my book was to present a bias-free version of Plath's life for that younger audience. I think I largely succeeded in doing this, keeping it straightforward, hopefully easy to read, interesting and informative. I had intended the book to include illustrative photographs and sidebars, written to the guidelines stipulated in the contract. Neither of these added-value materials were used, sadly. I posted the unused sidebars on this blog in 2007, and hope that they can be read in conjunction with the text, to highlight certain things in the work, or on occasion to at least discuss topics intentionally not expounded upon in the text. Overall I am still thrilled to have had the opportunity to write the book. It gave me a chance to share some of the information I had acquired on Plath to that point. How I wish I could revise it with some of the things I have learned since! And, too, how I wish I had more than 10 weeks in which to write it! All links accessed 16 May 2014.